When he reviewed Coeur de Vétiver Sacré last week, Kevin said that L’Artisan Parfumeur (along with Diptyque and Comme des Garçons) no longer had "the heart for off-center or 'risky' perfumes". I'll have to regretfully agree about Diptyque, and I haven't thrown in the towel yet but admittedly Comme des Garçons' output has seemed a wee bit repetitive lately. On the subject of L'Artisan though, I'll have to respectfully disagree. I did not love Coeur de Vétiver Sacré, and I didn't love the two before that — Al Oudh and Nuit de Tubéreuse — either, still, loving a perfume is not the same as respecting it. None of them were dumbed down or boring, and Coeur de Vétiver Sacré and Nuit de Tubéreuse in particular struck me as interesting attempts to do something new with raw materials that can easily descend into cliché. If anything, I think L'Artisan is looking better than ever since they took on perfumer Bertrand Duchaufour as the not-really-exactly-the-house-nose. I adored Havana Vanille1 (and in today's rapid launch environment, it's hard to remember that Havana Vanille is barely a year old). I adore Traversée du Bosphore even more. Havana Vanille went on my buy list, but Traversée du Bosphore will probably get added to my collection first. Traversée du Bosphore was inspired by a journey to Istanbul, and if you want to read the PR copy you can go take a look at the fragrance announcement, which includes what might or might not be a list of notes: tobacco smoke, apple, tulips, saffron, leather, Turkish Delight (rose and pistachio), musk. The leather, not quite smooth, not quite rough, is strongest in the opening. As advertised, we've also got some tobacco, fruity and sweet and not particularly smoky, in the early stages. There are spices, there is a touch of green. The apple is quite noticeable on paper; on skin, less so, although it stays fruity nearly to the end. After about 30 minutes, the tobacco fades to a soft hum and the leather turns to the merest suggestion of suede, and Traversée du Bosphore slowly turns nutty-foody. There is rosewater and later, powdered sugar. It's sweet, but it's not the syrupy sweetness of say, Serge Lutens Rahät Loukoum. Later still, it's a rather quiet musky-woody vanilla, powdery and just slightly nutty. In case any of the above makes Traversée du Bosphore sound like a heavy spiced oriental, it's not: like Havana Vanille, it feels rich but (relatively) sheer, and it doesn't overwhelm in warmer weather. If you are particular about the gender identity of your fragrance, I would say it is unisex, but that the opening is likely to strike some women as too masculine and the dry down is likely to strike some men as too feminine. L’Artisan Parfumeur Traversée du Bosphore is due to launch in November, and will be available in 50 ($115) and 100 ml ($155) Eau de Parfum. The lasting power is reasonable, but on the lower end for an Eau de Parfum. 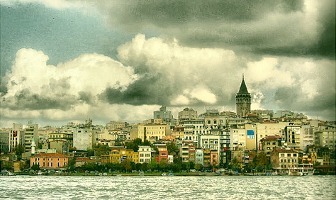 Note: top image is autumn in ISTANBUL... [cropped] by UyKuSuZ'a MaSaLLaR at flickr; some rights reserved. 1. Turns out that there is no more Havana Vanille: it's been renamed Vanille Absolument. Nice review, Robin. I want to try this one, if only just for the name. It’s a wonderful name! And yeah, tidal wave is an understatement. I’m also dumbfounded by the fact that it’s only a year since HV’s release…. Since I jumped on a blind split of this (just a teeny one), I’m glad to see a positive review. Still, I thought HV would be perfect for me, and it wasn’t at all, so I guess I’ll have to wait and see. It will likely depend on how quickly my skin eats through the top notes, since your first 30 mins sounds most appealing to me. Unfortunately, while I have Scent Glue skin, top notes usually vanish in a flash (literally – I’m often lucky if they last past that opening alcohol blast so I can smell them at all). HA, too many people bought Havana Vanille unsniffed, although a blind split is not so bad — to me that is just like buying a big sample. Hope you’ll love it! Yes! I’m one of those HV unsniffed purchasers – ended up swapping the bottle away. Nothing but vanilla extract on me. I didn’t detect any of the other notes. A disappointment! Otherwise, I’m heartily in the BD camp. Looking forward to trying this one! I can’t believe I haven’t even tried HV yet. R – do people find VC&A Bd’I to be sweet?! It’s so dry & woody on me – love that stuff. You know, BdI is so dry on me too! Or at least, there is sweet vanilla but it’s totally cut by the dry wood. But many people found it too sweet. I’ll fix that, V…have something else for you anyway. That’s cool Boo! I have a couple of things around here that may be of interest to you too. Hahaha… I was going to offer to fix that for you, V, if E hadn’t. It’s like, “Take my HV, please!! !” It’s not that HV was sweet to me… it just smelled sort of sour to me. I’d have been happy if it were pure vanilla extract. good news ladies! Our bottles are shipping from Henri Bendel today! I just spoke with the SA a little while ago….veddy veddy exciting! Joe – if I like the HV after sampling, perhaps I can take it off your hands – sounds as if you have an unloved decant. Yay! I can’t wait to try this! So weird. I got no vanilla. Well, maybe a vanilla bean left in an ashtray for a week. Oh, the ashtray was for cigars. I got wet ahes, damp and dirty, a tiny spot of vanilla, but artificial. This one didn’t work on me at all. Diptyque’s Vanilla Duelle was lovely on me. Must try this one, although I am really really scared of the apple. I only did a split there, too, though a bigger one. I still haven’t figured out quite why it doesn’t work for me, but I guess I won’t put too much effort into it. I wouldn’t make the effort either. Robin, I just tried this one earlier today, and I couldn’t wait to hear your own thoughts on it! I happen to love it, too. That sweetish, nutty-rosey-musky base, with just a hint of the soft leather remaining ng… delectable. I expected something smoky-spicy, but this is much more my style! I was trying to decide if it was sweeter than Havana Vanille or not? I just CANNOT find my darned Havana Vanille anywhere, I’ve ripped my office apart. Very annoying. Also really wish, for the gazillionth time, that L’Artisan still sold 15 ml bottles. Then I would buy this AND Havana Vanille. Hell, I’d be happy even if they did 30ml bottles. So true! And they stopped making small bottles right as other companies started making them. It’s very strange to me. I was hoping for smoky-spicy, but this sounds pretty good nonetheless. I’m instantly drawn to anything even remotely connected to Istanbul, anyway. Can’t wait to try it! You’ll get spicy in the early stages, anyway. Maybe a hint of smoky, but not much. I wasn’t crazy about NdT or HV (didn’t try Al Oudh since I’m not into oud) but this sounds like it would be worth trying. Any mentions of leather and tobacco are enough catch my attention. LAP is a funny brand. I find them very interesting even though I’ve yet to smell one that I’m genuinely passionate about. I probably liked Dzing! and Safran Troublant best. I also had high hopes for Coeur dVS since I love vetiver but if since neither you nor Kevin were impressed with it, I’m a lot less desperate to smell it which is just as well since it takes forever for the new Artisan releases to show up in the area. I’m looking forward to the new Hermessence, very curious about that one. Another iris dominant frag from Hermes and also done my a ‘minimalist’ nose. Will be good to compare and contrast. I liked the Vetiver better than Kevin did, but I didn’t love it by any means. I think of TdB as two scents, almost: you have the leather tobacco, and then the Turkish Delight. The first time I wore it, I sprayed it on and then got involved with something else, and later when I smelled it again I was utterly perplexed — it was like a completely different thing from what it had started out as, much more so than usual. And cannot wait for the Hermes Iris! Hermes Iris – oh my! It is certainly WAY less jammy-syrupy than the opening of Rahat. Mind you, I love Rahat too. And yes, NdT was Juicy Fruit gum on me. Hermes Iris….uber-lemmings ACTIVATE! I’m always eager to try just about any new iris available! Nuit de tubereuse–I get a lot of green notes in it…no gum, which is okay even though I used to love Juicy Fruit. Wonder if your “green notes” are the “mildew” I get out of it. possibly….those would be “fuzzy” green notes…. This is the first I’ve heard of the Hermes iris. Good think I didn’t know earlier, though. The anticipation would make me crazy. Iris Ukiyoké, due out next month I think. So – tobacco & leather, rosewater, some spicy sweetness and some green thrown in the mix. Sounds loverly. It’s a must try, for sure. Thanks for the preview Robin. I am drooling a tad. HA! Then again, you had me drooling for Havana Vanille, and we know how that turned out. I’m also in on a split, so only a minor investment should I not like it. Ha! I almost fell off my chair…. of course I should fess up that I’m the world’s worst unsniffed-buyer…but I just split them up so it always works out okay. You mean the world’s BEST, of course! No one does it better than you! yes, of course…a better use of the language…..or perhaps it’s a matter of perspective…. Thanks for the great review, R. I’m excited to try it, but I’ll tell ya’, we have a little run of Evil Scent Twinness going on in the L’Artisan department. Havana Vanille was no go for me, but I am the proud owner of a full bottle of NdT, bought from a regular retailer and everything, very rare for me (well, alright, it was the Beautyhabit sale, but still…) and I am dying to smell the Couer de Vet. Will be able to sniff all these next week–we’ll see! Thanks for the review! I’ve never tried a perfume with notes of apple and turkish delight. Istanbul is one of my favourite cities and I love their sweets, the apple tea and apple scented tobacco for the narghile. I’m just not sure that I would enjoy it on my skin… but if you liked it, than it must be a good perfume and I have faith in BD. Nuit de Tubereuse is heaven on me, I wore it all summer during the worst heat. I imagine Traversee du Bosphore to be like a travel from Europe by train with leather seats (we have leather seats in some trains here) and when you arrive in Istanbul you are presented with all those delicious aromas. You know, I always think this kind of ad copy sort of creates expectations that the perfume maybe can’t fill…seriously doubt anyone is going to smell it and say wow, Istanbul! But I do think it’s lovely. I agree. I’ll keep an open mind and see what I think when I’ll try it. Thanks for the review, Robin. I am hit or miss with L’AP in general. But this definitely sounds test worthy. This year I seem to be attracted to unusual fragrances, so perhaps it will be fun. It really depends on what kind of musk they use in the base. I guess I am hit or miss too since I didn’t like the last two, but gosh, I own a LOT of L’Artisan. Oooh, now you’ve got me really excited, Robin! I pestered the life out of a l’Artisan assistant in Covent Garden last week (she kept assuring me that the ‘new’ one was Nuit de Tubereuse) until she eventually remembered that they’d received a small tester that day, of something that was something to do with Istanbul. After much searching, she found it in a drawer, so I finally got to test TdB…and I loved it. Turkish Delight on suede – delicious. But I never really know whether something’s a keeper until I test it at home, for a full day. Sounds as if the first sniff was a true one – I can hardly wait! Oh good, so glad you got to try it! Didn’t they have the vetiver either?? That’s supposed to be before this one. The Vetiver’s only in Liberty, I think. Neither of the two l’Artisan shops I went to had ever heard of it! Both tried to direct me to Timbuktu, as soon as they heard the word ‘vetiver’. And one SA said ‘Why on earth would you think there are two new ones?’, which left me (almost) speechless. ??? I’m speechless as well! to not have it in stock is one thing, but to be an SA in a L’Artisan shop and not even have heard of it??? that’s sort of appalling . Nothing like an ignorant SA making out like it’s you who’s the one who doesn’t know what you are talking about, eh? thanks for the review R! sounds like a must try! It’s definitely worth a shot. Oh goodie – sounds like a winner to this Bertrand Duchaufour Fan Club Member! Can’t wait to smell this. I too loved Havana Vanille and this new ones sounds like something that ticks all of my boxes – especially the Turkish Delight accord. I am really interested to hear if men find it too feminine? My husband said it was, but he is clueless on the subject. Ditto all of Mike’s post. Well, unless the leather is too strong. But you say it’s only strong in the opening? H, to me it’s a leather scent all the way through, but more soft like Daim Blond, if you know that one. Much more sedate than Cuir de Russie, for example. Well then maybe I can handle it! Haunani, to me, it is strong for about 10-15 minutes. After that it’s very soft & smooth. This sounds wonderful and it’s the first L’Artisan in years that I’m looking forward to trying. I’m pretty sure that I will love it. So why is it much more expensive than other L’Artisan perfumes? All the edps are that expensive, I think. Yeah, it’s the same price as Nuit de Tubereuse & Al Oudh, but more than Vetiver, which was an Eau de Toilette. I have had a look at the online boutique (for Europe) and Traversée du Bosphore isn’t available yet. I always enjoy reading your reviews, Robin, although I’ve learned over the past few years, that we are pretty much EST’s. I do find that helpful though. This one doesn’t sound like me at all, but I know if I just wait ten minutes, something else will be released that will! Good, then you can cross this one off your list! (I know. Pickypickypicky.) Anyway, I’m not all that intrigued with this, although if a sample drops in my lap I’ll test it. Robin – have you laid a nostril on any Carillon pour un Ange yet? I think you said there was a mixup with your sample. I still have my sample in my purse, and I noticed recently that although it’s tightly capped, my entire purse (big 9 x 17″ tote) smells of lily of the valley. I *like* it. Yes, I have finally! I adore the opening, can’t make up my mind about the dry down. I wore it 4 times so far, and twice I loved it all the way through, but the other 2 times I didn’t — turned massively soapy and a little sour on me. Have a feeling it’s a fabulous scent that just doesn’t work on me for some reason, but am definitely going to give it more tries. Adding: but I adore the Rose Vermeille, that one is simply gorgeous on me. URV was so very gourmand that, while I think it’s brilliant – and the raspberry-rose part is gorgeous – I’m not sure about it as a whole. *Beautiful* scent. But would I wear it and be happy in it? I’m not convinced. The first couple of times I wore CPuA, the drydown sort of disappeared, but every time I’ve worn it since (two drops constitutes a “wearing” for me, it’s so potent), the earthiness has grown on me. I don’t feel I need a bottle right now since I still have about 70 ml of my 2006 Diorissimo. When it’s gone, though – CPuA awaits. Oh my — you know NOTHING is going to make me replace Diorissimo. Oh, except if Dior continues reformulating it into stupidity. Sounds lovely and going on my to try list. I didn’t catch it if you wrote it Robin, but full bottle worthy? Oh yes. I’m buying, anyway. Robin, thanks for this great, descriptive review, and I must say I agree with you in spirit if not in detail. I think Traversée is amazingly lovely. Perhaps to my nose it is much more plush and soft than it was to yours — I get nothing near rough leather, but rather only a sweet, nutty, smooth, luxurious suede. Both the tobacco & saffron are *very* subdued to my nose. In fact, what I really want to do is get myself a decant of Daim Blond to decide between a full bottle of that or this one. I think Traversée will win out because it seems a bit more complex, and I love that delicious nutty loukhoum accord. I don’t think anyone needs to worry about this being too sweet or too rough — as you note, it’s certainly not anywhere near as cloying as Rahat (which I enjoy… one or two drops of per year). I find Traversée an amazing comfort scent and perfect for fall. I really look forward to being able to spray liberally. I think L’Artisan continues to turn out good and artful products, even if they’re not to my taste (looking at Havana Vanille). Your description is more like what I smell in the dry down…wouldn’t call the opening rough, exactly, but more like leather than suede, and definitely some tobacco. Daisy – what about the apple note listed? Lol, that’s how I enjoy Ambre Sultan. My 2ml sample should easily last me a lifetime. Thanks for your take on Traversée too, definitely liking the sound of it. My poor little Havana Vanille! So much disappointment! I, for one, love it very much. I love it too…and I think Angie bought a bottle. As I said above, I bet it’s a big seller. Joining the Havana Vanille lovers. A comfort scent if there ever was one! You know, it’s funny that I enjoy HV but don’t love it until it’s been on for twelve hours. Then it turns into the most clear, un-syrupy, liqueur-like vanilla. Yum. I’ve never run across such a non-powdery, unsweetened vanilla before. Interesting! I think I agree. As Robin said, it’s got a transparent quality. Well, as you know, I am in love with CdeVS, but I can’t wait to try this one! Will you actually buy a full bottle, R? I think so. Will wait for a nice deal / coupon if I can. Was just remembering how badly I also want The Different Company’s De Bachmakov, but since that one isn’t in the US I think I’ll just buy this! Oh, I loved my trip to Istanbul six years ago! My strongest olfactory memories are apple tea, the flavored smoke from the narguiles (mint, apple, melon…. ), Turkish delight, and the spice markets. This sounds like it captures all of it. L’Artisan’s scents have gotten more daring and more edgy in recent years, not less! I understand that some people instinctively romanticize the past – “Everything was better in the old days, and everything that’s new stinks!” is a pretty common opinion. But compare Dzongkha and Nuit de Tubereuse to La Chasse Aux Papillons and the original Tubereuse. No question which ones win the “edginess” award! Oh, but don’t forget Dzing and Mechant Loup and Bois Farine…and on and on! I think it’s a great company, and I also love the pretty florals — I love my La Chasse. But agree they are doing less “pretty” than they used to. Oh, we had opposite trajectories: I get spicy drying down to powdery sweetness! Inspired by Istanbul you say? I think I need to put this one on my list. I’ll try this one just as soon as it makes its way over here, to the former Soviet bloc… The comparisons to Daim Blond are also encouraging — I loved the decadent sweetness of that one. Istanbul is apparently a big selling point. i look forward to sniffing this too. I love Vanilia and was so happy to find a small boutique here in Belgium selling their remaining 50ml bottles (theres 2 left). I don’t like that Vanilia was ‘replaced’ by Havana Vanille 1 yr later to now be called Vanille Absolument. it is a bit confusing – does this mean that the juice will be slightly altered as well? So far as I know the juice is the same. I assumed (but did not ask or verify) that there was a trademark problem with the name. I have liked, but , not loved the last three launches from the house, today I sniffed Coeur De vetiver Sacre (boring) at Barneys, then headed to bendell to sniff this one, I was AMAZED enough to buy a bottle, not heavy at all, and sweetness is not cloying, really unique. I’m very late to the party here, but I have a good excuse. Sadly, Msr. Duchaufour’s compositions generally don’t work on me. Havana Vanille was a boozy, vanilla-free mess and my boss actually asked if I had been drinking. I’ve tried almost everything I could get a sample of and the only exception is Dzongkha which is a sort of soapy iris on me. I’ve seen iris listed in the notes of TdB, and according to Luckyscent is contains real orris absolute and one reviewer claims to get nothing but iris. I know that iris is one of your favourite notes but you don’t mention it in your review. Is there no detectable iris for you? I also don’t find VC&A Bois d’Iris sweet unless I’m wearing Iris Silver Mist on the other wrist and comparing the two. I love both of them and don’t find ISM to be the funeral dirge in a bottle that some people suggest. So agree on your last point: the VCA only seems sweet when I wear it next to something else! It’s hidden sweetness. What a disappointment. I was hoping to get a highly spiced and complex scent, especially since I just came back from Istanbul right when this perfume came out. Instead, it was a sickly scent, full of bitter notes and weird spices. For once, I was glad that L’Artisant has minimal lasting power. I’m disappointed, too. From everything I have read i thought I would love this immediately, but it smells like the bottom of my mom’s purse: a little leather, crumbles of face powder, waxy Avon lipstick and cellophane from old hard candies. Does not evoke Istanbul at all. I bought this (mail order from L’AP) and it arrived yesterday – chief reason for buying was this review, Robin and some promising words via Twitter from others. I just LOVE it. I’m not sure I get the apple, I do get a slight bourbon-y sweetness, and a softness which endears me to it. Agree 100% about the sheerness – there is nothing heavy here, it’s more a breeze through a window (or maybe a sail) than a whole freight train of ingredients. Would completely recommend – and this from someone who wouldn’t necessarily count herself an L’AP fan. Oh, I’m so glad it worked out — you were brave to buy it unsniffed! I received my small decant today. I really like it. It is definitely changes after a few hours. At the end, I kept thinking, “This reminds me of something else. What is it? !” I finally figured it out. Just going by memory, without a side by side…Acqua di Parma Mandorlo di Sicilia. I would not have thought them much alike, interesting! And the Mandorlo is much cheaper, I’d think. I think TdB is a much more complex scent. Mandorlo is very linear. It’s only in the dry down of TdB that it reminds me of Mandorlo. Disappointed with my encounter with TdB. Maybe because I expected too much? Or maybe because I love another L Artisan perfume (Poivre Piquant) that I thought I am going to love this as well? Anyway, on my skin, everything (apple, leather, tobacco, etc.) or the combination of all these went too strong. It came into a point that I almost throw-up while having dinner since I can smell this at the back of my right hand. A “scrubber” for me. It finally arrived in HK and I sprayed a bit in the cleavage. It must have touched my t-shirt, cause all i keep getting waft off are the same “Root beer” smell as AdiP mandorlo! Funny to see Bluests comment….If I bury my nose in the t-shirt i get dzing….must be the leather. Not something i will be buying! I really wanted to like this one (maybe because I like the name), but it just doesn’t work on me. All I could smell was a sweet, Play-Doh/modeling clay thing. Robin, nice review…is it too risky for a man to order it blindly? i do not have problem with somehow sweet perfumes but not feminine. what do you think? My only concern was that…i usually order items unsniffed bcoz in my country nothing is available from niche perfumes. U see this or dzing to be more masculine or better? They are both great scents. I like Traversee better and I think it’s easier to wear, Dzing is arguably a tad more masculine & also a bit weirder. thanx, will let you know once i get it…i’m waiting l’eau du navigateur as well….and bought so far timbuktu and mechant loup…something that i was disappointed by the longevity.